Today the annual pilgrimage to Comic-Con begins, bringing with it a new year of fantastic movies, TV, books, comics and games. Though this convention began as a humble gathering of comic book fans in the early 1970s, it has grown to attract over 100 thousand attendees as well as major Hollywood studios, producers sniffing for their next lucrative IP deal, and celebrities from movie stars to bestselling authors. But this convention, despite all the glitz, still keeps it real. And here's why. 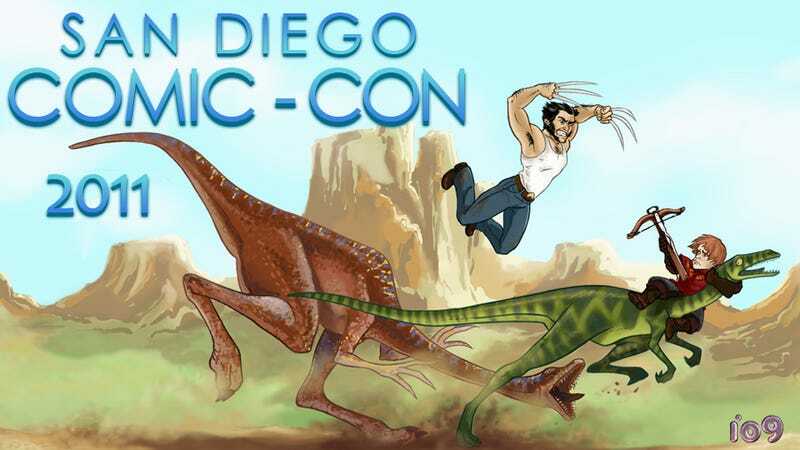 Though bigwig Hollywood types have been courting the Comic-Con audience ever since George Lucas decided to bring Star Wars to the con in 1977, the con isn't about stroking the egos of people in the culture machine. Far from it. The con organizers pride themselves on privileging regular con attendees over press, and merchants from small comic book stores get as many perks as publicists from FOX. This is one of the only cons I know of where having a press pass means almost nothing. As a member of the media, I still have to wait in those giant lines along with the fans to see the actors from Game of Thrones or catch some Spider-Man footage. Sure there are celebrity interviews and producers hobnobbing with talent, but that's not what the con is about. It's about giving fans a chance to interact with the people who create their favorite stories, and to do it face-to-face, while rubbing real (not virtual) shoulders with other people who love escaping dreary reality for a while to go to other worlds. Comic-Con is one of those rare places where real life offers us all the things we normally do semi-anonymously online, like debate the ending of a TV show, share cool pictures, and tell writers we love what they've done. It's also a chance to discover new distractions and beautiful things. Taking a stroll around the cavernous floor at Comic-Con, you'll stumble across everything from videogame demos to rare action figures, indie comics, and art that will electrify your brain. You can meet a comic book writer whose work you've been reading since you were a kid, or get a poster signed by somebody whose web series has made many workdays more bearable. And best of all, you can make new friends who care about scifi, fantasy, horror, and comedy as much as you do. If you're watching from home, don't fret. Our coverage will be almost like being here, except with air conditioning and no crowds. And if you're here, io9 has just one request for you. In between gorging on merch and gawking at celebs, we want you to make one new friend. Yes, that's cheesy as hell, but that's what you're here for, dammit! So strike up a conversation with somebody in line, at a booth, or just standing around in the hallways of the Convention Center. Introduce yourself. Here's a good opening line: "So what kind of stuff are you here to see?" Now let us go forth and geek out!